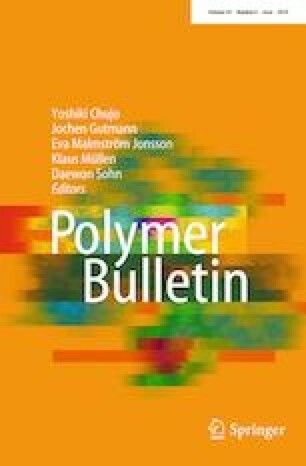 Hydrogels are among the most used polymer–drug systems, polysaccharide-based materials presenting many advantages to be used for controlled release applications. Gellan maleate/NIPAm hydrogels are hydrophilic swelling matrixes that were originally developed for biomedical applications as controlled release dosage forms. The purpose of this study is to explore the ability of gellan maleate/NIPAm thermoreversible hydrogels for ophthalmic applications as ocular inserts. Studied hydrogels were synthesized by free radical grafting/polymerization of unsaturated esters (gellan maleate) with N-isopropylacrylamide (NIPAm) and N,N′-methylenebisacrylamide as cross-linker. They are evaluated for swelling degree, in vitro inclusion and release of drugs (adrenaline and chloramphenicol) and in vivo biocompatibility. The hydrogel is shown to be a temperature-responsive material with a LCST close to 36 °C. The swelling properties and the release of biologically active compounds occur when polymer conformation changes determining phase transition at LCST. Gellan-based hydrogels present reproducible responses to alternation between ambient temperature and human body one. The stability and biocompatibility were evaluated in vitro and in vivo. Tissue response to implantation of hydrogel was determined by histological analysis (haematoxylin–eosin–methylene blue and periodic acid–Schiff). A thin fibrous capsule was observed around the implanted hydrogels. No necrosis, calcification and acute inflammatory reaction were noted. Successful preliminary results were obtained for ophthalmic applications. The authors would like to thank the Agence Universitaire de la Francophonie (AUF), for financial support. Prof. Dr. Corneliu Cotea from Ion Ionescu de la Brad University of Agricultural Sciences and Veterinary Medicine of Iași is acknowledged for biocompatibility experiments.